John has been a staple on the Albany Jazz scene for many years playing solo as well as with established groups and most recently with his own group called Airwaves. 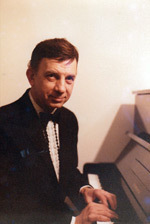 He has played piano with the J.R. Montrose Quartet and later with the Nick Brignola Quartet. He has backed many Jazz Artists including: Zoot Sims, Chet Baker, Ben Webster, Al Cohn, 'Doc' Cheatum and he has played with the Big Bands of: Buddy Morrow, Glen Miller, and Bob Crosby. John was a finalist in the National Collegiate Competition and took 1st place in the Yamaha competition for the the Notheast. John has lead his own group, Airwaves, for the last several years.